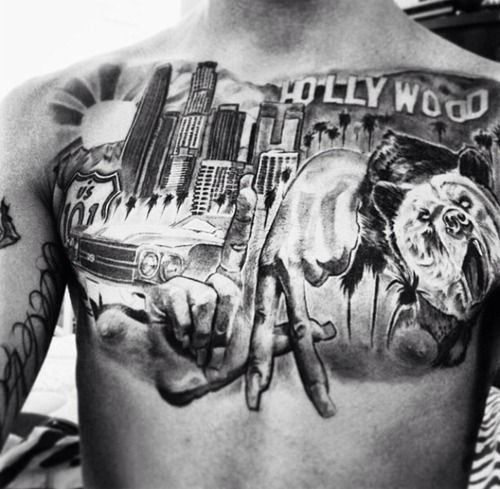 This tattoo enthusiast has chosen 3 glamour icons of Los Angeles for their LA tattoo. The classic Hollywood sign, the Capitol Records building, and the Rodeo Drive sign. This wearer truly loves their city. 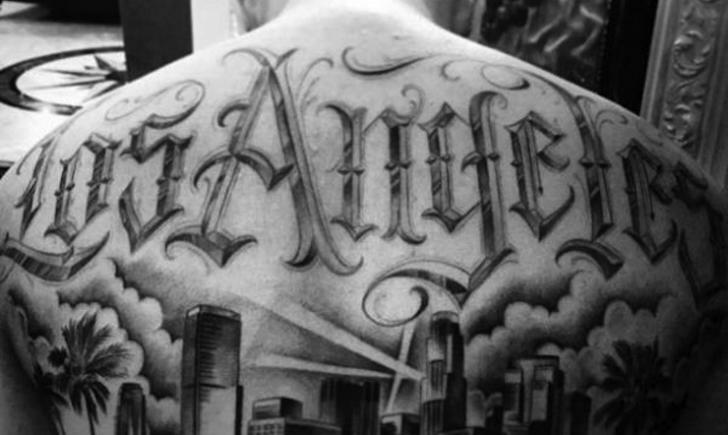 Taking up the full upper back and shoulders, we have in bold script “City of Angels” in the clouds, above the Hollywood sign, among what else? Palm trees, of course. 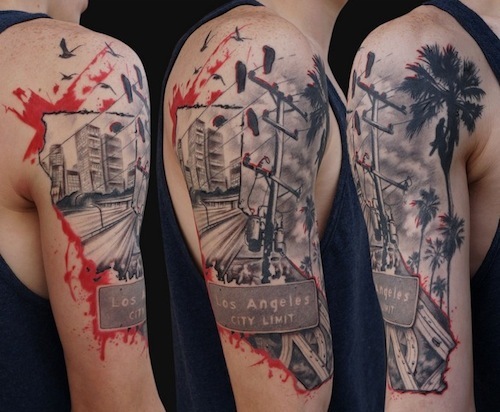 This half sleeve truly captures the downtown feel of Los Angeles. Skyscrapers among the clouds, stylized in a way that is familiar to those from Los Angeles. 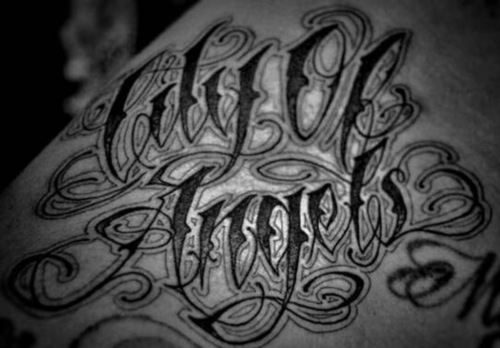 “To live and die in LA.” Pretty much sums up the feeling those who love their native City of Angels have for it. 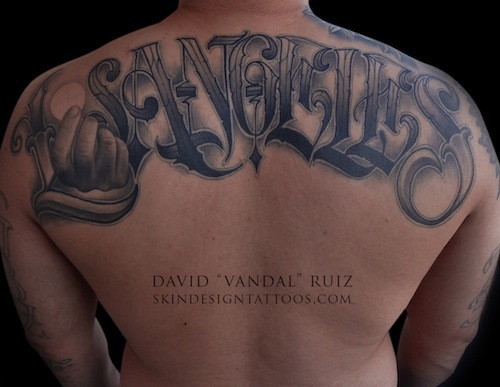 For better or for worse, with the bulletholes as well as the distinct LA Dodgers symbol make up this deeply Los Angeles tattoo. 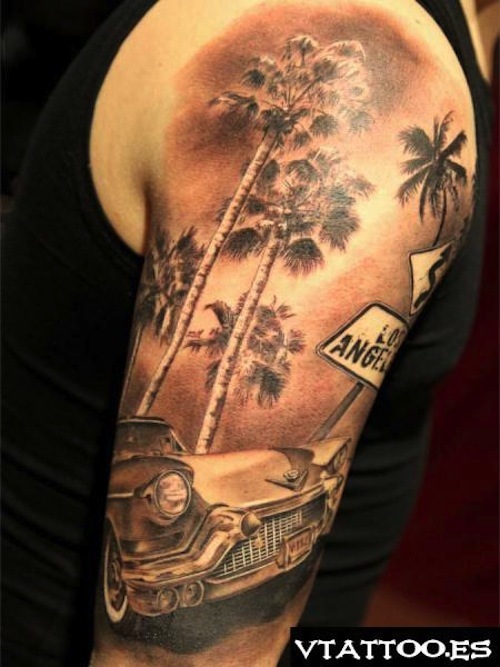 Done in a polka trash style, this tattoo captures the feeling of Los Angeles, framed within the shape of the state of California. Palm trees, power lines, freeways, and city limit Los Angeles sign. 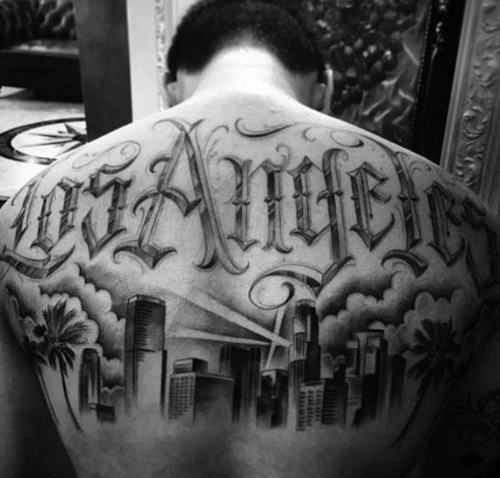 Heres another Los Angeles script tattoo in the clouds taking up the wearer’s upper back, this time with the downtown skyline below. Classic LA hand symbol here. All those native to this city are very familiar with this and probably learned it as kids. 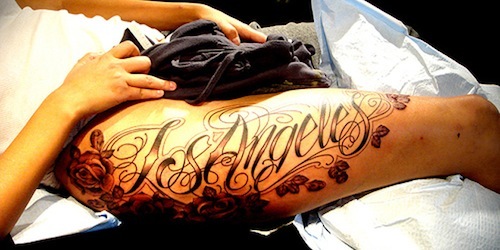 Taking up the hip and upper side thigh portion of this tattoo wearer is a feminine, swirly script saying “Los Angeles” with roses below it. 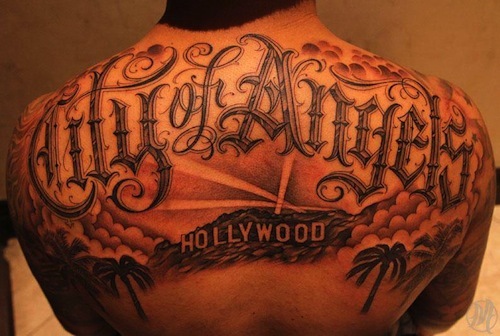 In this upper back Los Angeles script tattoo, there is a hand holding up the moon for the “o”. Who out there is a Lakers fan? We know this Los Angeles resident is, for sure! 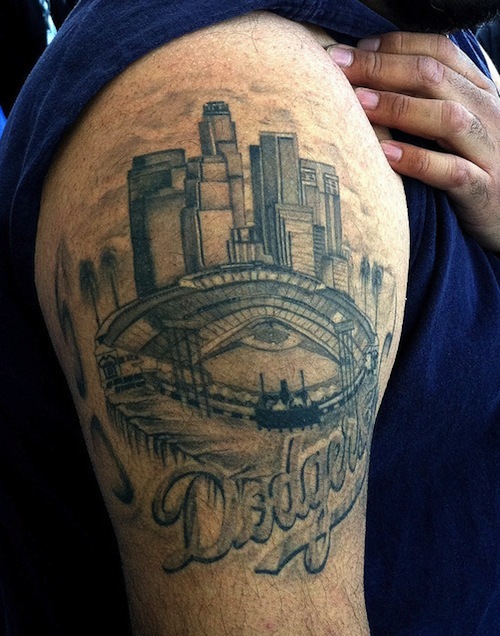 Any Los Angeles native’s heart swells with pride upon seeing this tattoo of Dodger Stadium and the downtown city skyline right behind it. Classic LA. Go Dodgers! 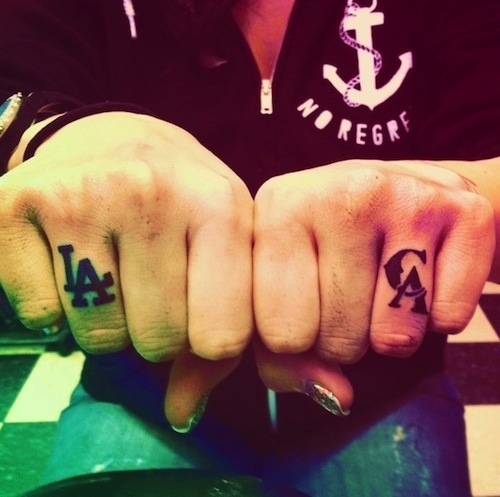 LA (using the Dodgers LA symbols on one ring finger) and CA (using the California Angels symbol on the other). Very clever! 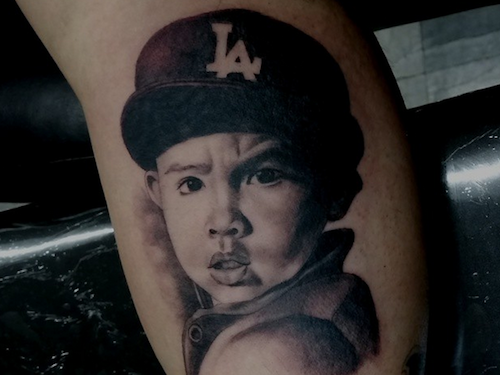 Here’s a black and gray, realistic portrait of a loved one wearing the classic Dodgers hat. 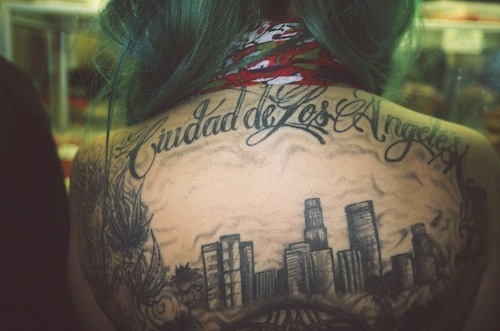 This woman has her upper back LA script tattoo in Spanish, “Ciudad de Los Angeles.” Living in LA, even if Spanish is not your first language, you tend to pick up some Spanish here and there. 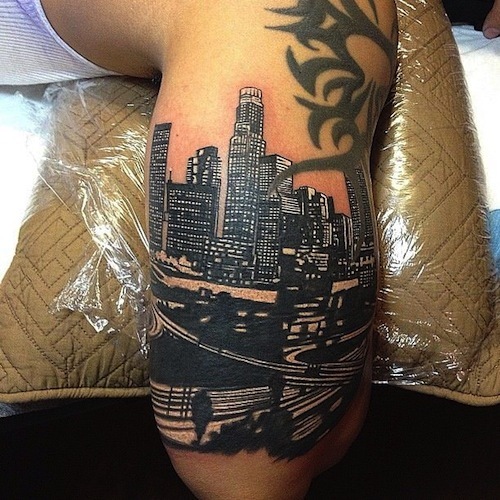 This tattoo is also showing the city skyline below, mid back. California scene with a classic Cadillac cruising along a palm tree-lined road. 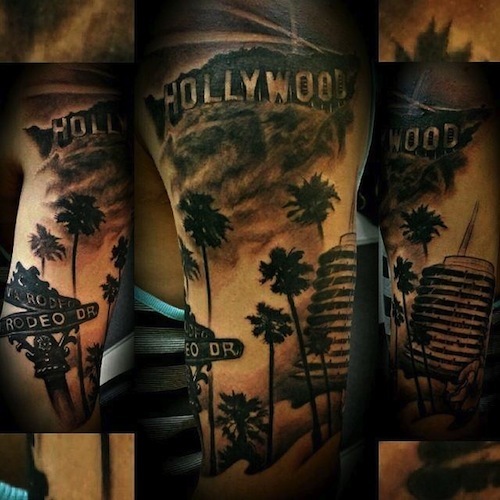 Los Angeles sign along with a road sign that may be hinting towards Mulholland Drive is also included in this half sleeve. 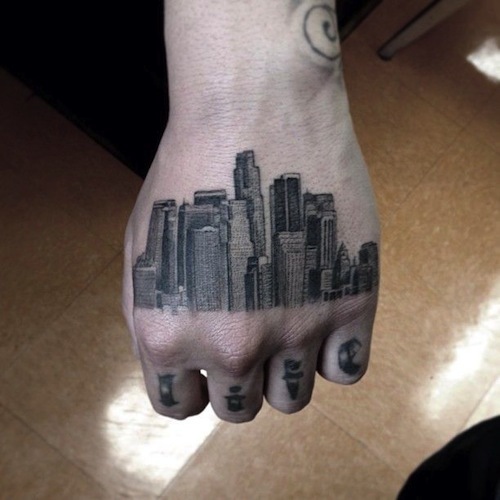 This tattoo wearer decided to get the whole downtown landscape onto his hand. Nicely done! There is a lot of traffic in Los Angeles, but a lot walking as well. 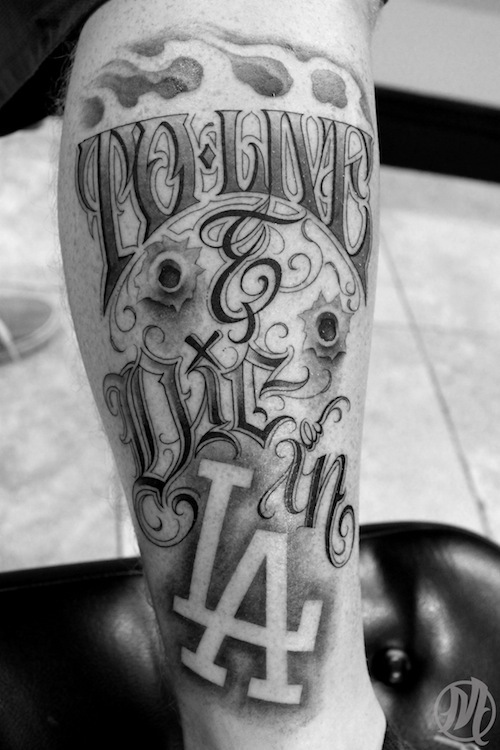 To get “Los Angeles” as a foot tattoo makes sense! 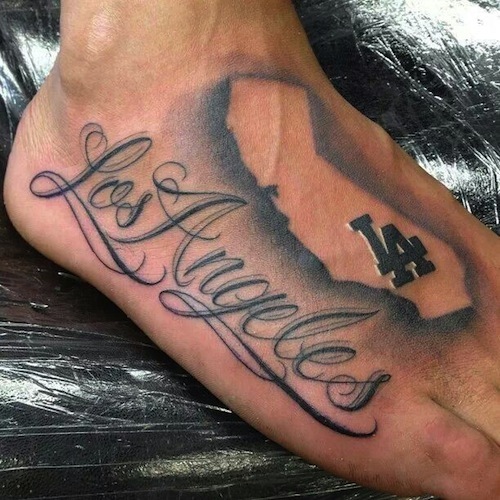 The shape of California state with the Dodgers LA symbol where Los Angeles is located within the state is also a great idea and a clever tattoo design on its own. This depiction of downtown LA is the way the city looks at night, with its many twinkling lights from the skyscrapers and cars on the freeway. 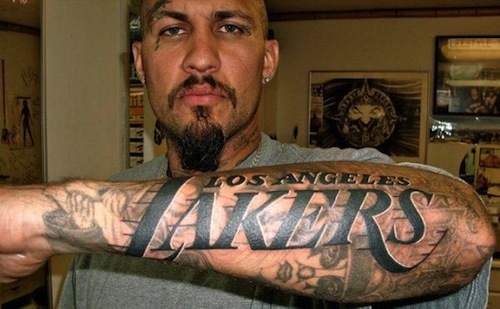 This might be the best Los Angeles tattoo on this list. 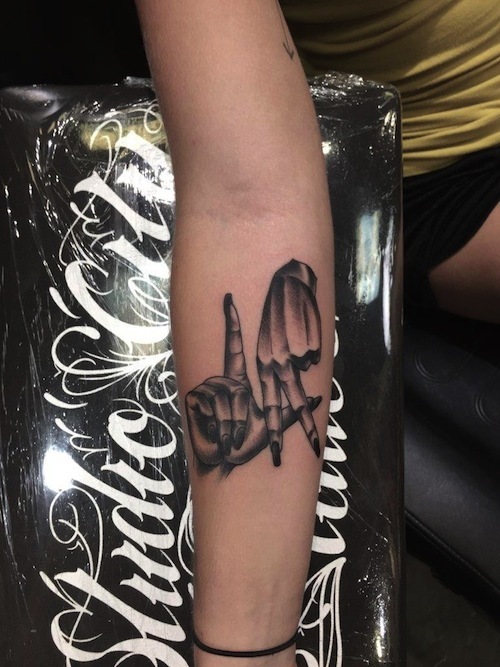 As a chest tattoo, the LOS Angeles hand symbol is near the heart. Classic cars cruising, the Holywood sign, palm trees, sunshine, downtown, the 101, it’s all about the city of LA!